These looks great I suppose these two are pre-evo of Vulpix and Growlithe, yes? Great. The electric tiger-mouse, that is a Pokemon in Pikachu-family like Pachirisu and Emolga? Gen 9? Have I missed Gen 8 or what happened? Wait, I thought 8 came out. no. Alola (Sun, Moon and Ultras) is Gen 7. You did an outstanding job with Wolfman and Warwolf Ice types the art brings out subtly their werewolf aspect. Your Politoed, Blossomole and Pangshi look great. I DIDN'T LIKE THE TIGER SO MUCH.... BUT YOUR DRAWING IS SOOOOOO PRETTY THAT MAKES ME TO LOVE IT! Really great renditions while staying true to the sprites! 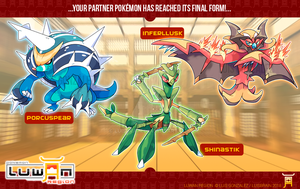 ; this makes me a little sad that these didn't make it! And that tiger ball one is ADORABLE!!! I want one! SO CUTE!!! I don't know which one I love them most! What is the bear-like one suppose to be? Yes, old Gold demo got leaked, everyone is losing there minds over it. 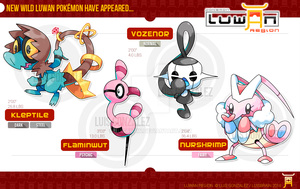 shweet yeah just saw the list and putting them into a mini fakemon poke'dex i'm making!! man, BABY GROWLITH IS ADORABLE and that gen 2 murkrow!! That Beta Vulpix is cute! omg yesss! Your style is perfect for these ! Also, that flower 'mon could be a beta for Flabébé's line but it appears within Chikorita's line...what? WHAT THE HECK THESE WOULD'VE BEEN AWESOME!! This just proves to me personally why Gen 2 was so great though. The charm in these designs!